Cut 6 pieces of drop cloth fabric to 14 x 22 inches. Sketch some designs inspired by Maritime Signal Flags and use painter’s tape to map out the lines on the drop cloths. Spray paint the cloth in a color of your choice, filling in all areas around the tape. When you finish painting, remove the tape and let the first color dry. Once the first color has dried, use painter’s tape to cover the area you have already painted. 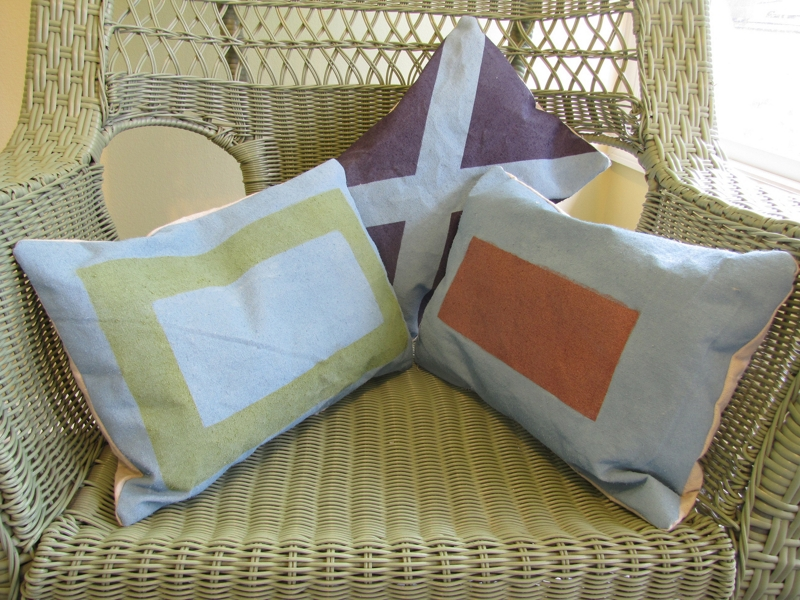 Spray paint the rest of the pillow in your next color, remove the tape, and let it dry. Once the paint has dried, stitch the panels’ right sides together, leaving an opening for turning and stuffing. Trim the corners before turning the panels inside out. Stuff the pillow with Fiber Fill.